changing taps, and tributes to all things local. Darcy and the Indian Root Pills sign immediately spring to mind. The huge sign sitting proudly behind the bar proclaiming "Free House - King William IV" is an original relic from England. In true 17th century spirit it voyaged to Maitland by ship and now oversees everything that happens as the centrepiece of the bar. The namesake was chosen in honour of the steam ship - the King William IV - which was built in in Clarence Town. In keeping with the localised theme, an entire night will be dedicated this week to the beers made by Morpeth Brewery and Beer Co, not far from King Bill's castle. The 12 tap beers of the venue will be taken over by Morpeth-made beers, as a craft beer degustation dinner gets underway. Serving six-courses of tapas style meals matched with 6 different beers from the family-run brewery, Maitland locals will have a chance to enjoy a night of local produce and brews - all without having to travel to Newcastle. 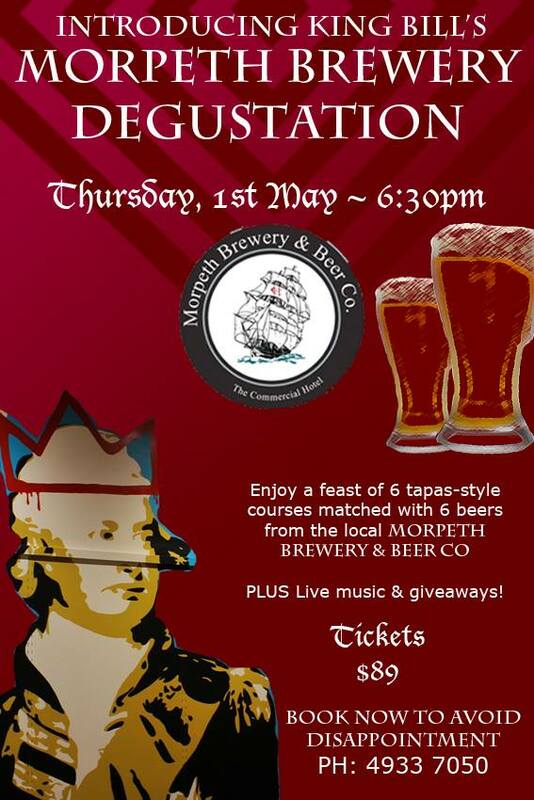 The Morpeth Brewery Degustation is on Thursday 1st May, 6.30pm. To book, call (02) 4933 7050. For more information, visit the King Bill IV Facebook page.